We’d love your help. Let us know what’s wrong with this preview of The Tiger at Midnight by Swati Teerdhala. Kunal has been a soldier since childhood, training morning and night Esha is a legend, but no one knows. It’s only in the shadows that she moonlights as the Viper, the rebels’ highly skilled assassin. She’s devoted her life to avenging what she lost in the royal coup, and now she’s been tasked with her most important mission to date: taking down the ruthless General Hotha. To ask other readers questions about The Tiger at Midnight, please sign up. This is so intriguing! I adore stories that meet in the middle of two drastically opposing sides. What inspired you to write The Tiger at Midnight? Swati THE TIGER AR MIDNIGHT is definitely an exploration of the moral greys of war, duty, and honor--which I've always been interested in! I actually had…moreTHE TIGER AR MIDNIGHT is definitely an exploration of the moral greys of war, duty, and honor--which I've always been interested in! I actually had the idea for The Tiger at Midnight while visiting a fort on vacation. I was looking out one of the windows of the fort, wondering what image would stop a dutiful soldier in his tracks and why. In this case, it happened to be a girl who's in the wrong place at the wrong time. But why? Sooo I'm a little biased here, because Swati is actually my writing mentor and a lovely person - but I REALLY loved this book (and I would have loved it just as much even if I didn't know her personally)! If you know anything about me, you know I'm a huge fan of the cat and mouse trope - and heated banter. Like please give me all the heated banter forever and ever amen. So with that said, my heart was so giddy over Kunal and Esha! They are my children now and I love them and ship them endlessly. Sooo I'm a little biased here, because Swati is actually my writing mentor and a lovely person - but I REALLY loved this book (and I would have loved it just as much even if I didn't know her personally)! If you know anything about me, you know I'm a huge fan of the cat and mouse trope - and heated banter. Like please give me all the heated banter forever and ever amen. So with that said, my heart was so giddy over Kunal and Esha! They are my children now and I love them and ship them endlessly. But the best part (banter/heat aside) was the seriously incredible world building. First of all, the Indian mythology was SO COOL - and the foundation upon which the two warring nations are built. I've never read anything quite like it, but I love how the legends weren't just myths but had the power to disrupt life at its core. On top of that, we have a super rich history that depicts the relationship between Kunal's lands and Esha's, and it only grows more complex as the story plays on. I love how nothing is black and white - and complications arise from all ends. What really made the story fun was that we go on a journey through both character's eyes - traveling through towns and jungles and cities and palaces. You won't be sitting still. The story starts as Kunal, a soldier, sees a mysterious girl lurking around his fort. He approaches her, and she pretends that she's merely lost her way. The two strike up a conversation - harmless, by the looks of it, and he helps her return to where she claimed she wanted to be. The next morning, Kunal wakes to find his uncle, the general, dead in his bed - with the Viper (an unknown assassin of sorts)'s weapon left in the room. The next thing he knows, he's sent on a mission to find the Viper. If he catches them, he'll be promoted - and can make a real change for his country. It doesn't take him long to put the pieces together - that the Viper, is in fact, the girl from the fort. I really don't want to spoil more than that, but be prepared for a whirlwind ride through emerald forests and colorful towns as the chase begins, and soon both Esha and Kunal are questioning everything they know and everyone they trust. The Tiger At Midnight was…alright. The writing was in this strange area between good and hmmm. The author did string together some admittedly beautiful descriptions, but there were a few bewildering turns of phrase. I suppose the author was attempting to spin a poetic metaphor of sorts here and there, except what we got was moreso…a haphazard bunch of words slapped together. On top of that, there was the occasional modern term slipped in, which, hmmm, did not match the ancient-Ind The Tiger At Midnight was…alright. The writing was in this strange area between good and hmmm. The author did string together some admittedly beautiful descriptions, but there were a few bewildering turns of phrase. I suppose the author was attempting to spin a poetic metaphor of sorts here and there, except what we got was moreso…a haphazard bunch of words slapped together. On top of that, there was the occasional modern term slipped in, which, hmmm, did not match the ancient-Indian vibes of the novel—buuut whatever. I guess I am nitpicking right now? What the writing did suffer from, however, was the telling over showing. In short, the author tends to state things instead of describing them, which gives the writing a glossed-over feel? It's frustrating, because what should be tense, evocative scenes are more often than not reduced to lifeless fragments of text. The writing wasn't bad, per se, but it was more so that there was a couple of aspects that could have been better. Just…little things here and there—which all in all, added up to a middling whole. Things like the mundane phrasing and there being not enough detail at times and the recurring inundation of filter words that conspired to incapacitate the writing for me, blunting the feeling and draining the oomph from what were the turning points of the plot. In spite of this, The Tiger at Midnight kept me entertained. Like, the pacing was perfect? And I won't lie—this novel sunk its claws into me (at first). It made me curious enough to read more, and I did—until I realised, two-hundred pages in, that it wasn't connecting, at which point I started doing a mental analysis of the reasons (re: above). So I did like it to some extent, and I'm guessing that this was a case of "it's not you, it's me". And ohgosh I feel like a douchebag typing all this up, but I have to justify why I'm not giving this four-stars plus. But as I said, hey, it's just me. (Feel free to, like, lose them in the couch or something). The Tiger at Midnight was one of my most anticipated debuts of 2019, however, it sadly fell a bit flat for me. It was just so... average. I felt like I had read it all before. Let's start with the positives. The world building was excellently done and I loved finding out more about the different places. The imagery of sprawling rainforests contrasted with bustling cities was a delight to the senses. The book was about two warring countries called Jansa and Dharka. Esha was an infamous Dharkan rebel assassin who went by the name, 'The Viper,' and was tasked with killing a Jansan army commander. Kunal was a Jansan soldier tasked with capturing The Viper. I felt like I was trapped in a time loop for most of the book because it was so repetitive and consisted of the same events happening again and again with slight variations. There were three stages. (1) Kunal finds Esha who he knew was The Viper and was supposed to capture. (2) Instead of capturing her, he has a nice little chat with her while he admires her gorgeous hair and chestnut eyes and she marvels at his beautiful eyes and his extraordinary kindness. (3) Esha escapes and Kunal lets her have a head start before resuming his pursuit of her once again. It was very frustrating because they both had responsibilities and tasks they had to accomplish but instead they were running around in circles all over Jansa whilst making heart eyes at each other. Don't get me wrong, they made a very adorable pair but I just wished there was more variety in their story. Also, Esha was supposedly a ruthless assassin but she doesn't really kill anyone or do anything particularly ruthless that would have earned her the level of notoriety she supposedly had. Her character wasn't very believable. The plot did become a bit more interesting near the end but the problem was, I found all of the plot twists so underwhelming that the effect was lost on me. Nevertheless, I feel like the way this book ended means that the next book has the potential to be really good. I want to read the next book in the series and, hopefully, I will enjoy it more! Thank you to Katherine Tegen Books and Swati Teerdhala for providing me with a digital arc of this book via Edelweiss in exchange for an honest review. All opinions expressed are my own. I started this book around 1 am. I finished at 6 am and am up writing this review (full one to come closer to publication) because I just cannot stop gushing about it. Definitely add this one to your TBR's, fantasy lovers! The Tiger at Midnight immediately caught my attention with its gorgeous cover. Before I knew it, the writing sucked me in, and after I got to meet the characters, I was thoroughly ensnared in its pages. This Indian-inspired fantasy is full of deceit, secrets, and a game of chase between two morally gray characters. It’s enthralling from beginning to finish, and I don’t quite remember when a debut fantasy ensnared me the way this book did. Readers follow the main characters Esha and Kunal - two vastly different people from vastly different standings - as they move forward in a fast-paced plot where the lands aren’t safe, and the kingdom needs balance. Who will get there first? And what will it take to do so? I reviewed an ARC of this book in July of 2018. I started reading this book on April 16, 2019, a week before it was released. Talk about procrastination. ARC provided by the publisher via Edelweiss in exchange for an honest review. all opinions are my own. weeeeOOOWWWW i'm so glad I have this on preorder (and it's coming on Tuesday!!!) because that was amazing??? 2) lush worlds!!! so much!!! Booklover925 I'm really excited for this release! Vicky Who Reads Booklover925 wrote: "I'm really excited for this release!" yessss omg it is wonderful I hope you enjoy!!!! Anyway, I was drawn to this story because of the diversity and wanting more lush, magical, reads in my life (ideally in a standalone format but whateverrrrr) and this is all that and more. We have a female assassin, working towards saving her people through whatever means necessary, and a young man on the opposing side who has been raised to believe something he discovers might not be true. There's an ailing kingdom, betrayal, romance, a cat and mouse chase, reunited friends, and plots upon plots. There's a lot to love here, particularly as the characters themselves are complex and both undergo some growth by the end of this first instalment. But. I feel like I only skimmed along the surface of this -- never really able to sink into it -- while pages flipped by at a quick rate, and I'm not sure I'll remember anything about this in a month. Much less a year. So, I don't know. I enjoyed it.. but. That's pretty much a good tagline of this one. I heard nothing about The Tiger at Midnight! I've not even seen reviews of it... I hope my review can spur on some buzz... because it totally deserves the attention!! It was quite easy to be pulled into the war torn world of The Tiger at Midnight. The opening scene is delightful and gives you a real taste of what is to come... because its flirting, sparring, one upping and even more bantering! This eases us into the Indian-inspired world caught in a war that is ripping the land and its people apart. We don't get too much world building in the beginning as we are meeting our two protagonists and getting to know each character's side in this war. Esha really captured my imagination right from first meeting her. The Viper is a morally grey rebel vigilante who evens the score in this war torn time. No one knows she works for the prince of the rival country... or do they?! The story starts when Esha realizes there is a third player in this game of war... Enter Kunal who totally made me want to protect his cinnamon roll heart. Not to say that Esha was the only kickass fighter... he was her equal and gave her a run for her money, but he clearly has the softer heart and a head for justice. This is clearly a romance. The Tiger at Midnight sets up these two people on the opposite sides of war drawn lines. We get a fun bantering duo who must decide what's important to them. And as we travel to the point they each must decide what the other means to them we get to experience every moment that builds their relationship. I really like the idea of this premise. And if romance is good for you then these enemies to lovers will melt your heart... but the whole mystery of the failing land is only lightly touched upon. We do get a solid direction by the end but its only a start. We also have this third player in the war that neither the rebel or the soldier knew was there... We get some resolution with this and I really appreciated how it meshed well with Kunal and Esha making some decisions about their relationship. So while The Tiger at Midnight is a cliffhanger it gives us some resolution and has nicely built us up to get into the meat of the war... and how to fix the problems with the land. There is something truly beautiful about this cover. I love the purple and gold color... I love the angle of the pediment the assassin is sitting on. I love that you can't tell too many features of said assassin. The only thing a touch underwhelming is the typography. It's a little boring. Still its such a gorgeous cover! Blessedly The Tiger at Midnight is a book you'll want to keep on your bookshelves... and isn't that such an intriguing title?! I love how the tiger at midnight is worked into the story too. Why should you plan on reading The Tiger at Midnight? The banter, the flirting, the fighting, the traps... these two totally make it an adventure to fall in love and we get to be in on the action every step of the way. The General that Esha targets is Kunal's uncle... Yes, what a dilemma! And it really is a major sticking point in their relationship. The whole mythology at the heart of the failing land bond is quite intriguing. We only get hints of this but I definitely want to know more. -Another side to the war! This was an intriguing aspect of Esha and Kunal's journey... we know there is someone else who has their own agenda in this black and white war... But who is it? Why are they acting now? At the last quarter of the book we are presented with those people who have become Esha's family. They aren't perfect and yet she is totally loyal to them... How does Kunal fit in? Can he? I do wish that the beginning was a lot tighter. There was quite a bit of duplication. The worst was that we got over and over about the land bond failing said different ways but not giving us any more information. It's fine to recap the information we've been told but we should at least learn a little more each time, whether from events or the characters' feelings changing and growing. The Tiger at Midnight sets us up to save a land torn apart by war... our reason to put ourselves out there?! Esha and Kunal... two people on opposite sides who actually value the same things. Will an epic romance be what brings together these fighting nations?! We'll have to see in the sequel... You'll want to get in on The Tiger at Midnight first!! The Tiger at the Midnight (title which you'll only understand its meaning at the very end of the book) is an Indian Mythology inspired story about two enemy kingdoms but is a character-driven plot. Meet Esha, a girl which happens to be also the Viper: a lethal, legendary assassin. Esha is a morally grey character that works for a greater purpose. Then, meet our hero, Kunal, a soldier which happens to be the nephew of Esha's new target. Kunal and Esha cross paths and while there's no insta-love, The Tiger at the Midnight (title which you'll only understand its meaning at the very end of the book) is an Indian Mythology inspired story about two enemy kingdoms but is a character-driven plot. Meet Esha, a girl which happens to be also the Viper: a lethal, legendary assassin. Esha is a morally grey character that works for a greater purpose. Then, meet our hero, Kunal, a soldier which happens to be the nephew of Esha's new target. Kunal and Esha cross paths and while there's no insta-love, there's an instant connection/chemistry between them. Kunal is an "honorable" soldier part of a not so honorable army (he is boyfriend material okay). What I loved most about him is how willing he is to forgive, how polite and tender he can be even though he is a soldier trained to kill. He feels the angst and is torn but he doesn't dwell on it over and over again like an emo teenager. He is balanced, calm. Esha is a badass and this book had no problems in acknowledging her with a superior fighting skill than the male protagonist. I loved how Esha reversed the trope of "hero saves the day". Now we get to the part that made me all smiley: the romance. I can't say much without being spoilery but if you enjoy banter and tenderness, you'll have it. Prepare yourself for a lot of travels and jungles. I really enjoyed the short chapters and flowing writing style. What I liked less was the "major" supporting characters. I think they lacked some depth, but most of them were introduced in the second half of the book, so I think the next book might deliver some more insight to them. Overall, I think it was a beautiful story and I sense the next book might give us more worldbuilding, politics and more focus on the "magic" aspect. A deliciously twisty cat-and-mouse story that had me racing through the pages. I love stories that challenge their protagonists' beliefs, and both Esha and Kunal face complex, heart-breaking decisions in their journey to discover both themselves and each other. Whenever I'd go to India to visit my grandparents as a child, they'd tell me tales from our Hindu mythology – of honorable warriors and strong queens, star-crossed romances and epic battles. These stories fueled my imagination and showed me that there was rarely pure good or evil in the world, that our lives are a series of choices we make. 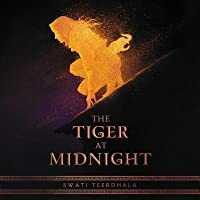 THE TIGER AT MIDNIGHT is my homage to those tales and combines SO much I love -- action, romance, mystery -- in a setting that's filled with magic and Indian history. I can't wait to share this story with you all! "A truce. No killing you in your sleep, soldier. You let me live and I did the same. Now catch me if you can." This is one of those books I’m sure majority of my YA-fantasy-lover friends will love! I have a feeling this is going to be huge. Watch out for this book!!! I'm sorry but I'm not clicking with this book and I'm not in the mood to force myself to keep reading. I decided to stop reading The tiger at midnight because every single chapter I've read was so full of info-dumping that it felt like I was studying instead of reading. No thanks. But I have read just a few chapters so I'm not going to give a rating, it wouldn't make sense. Have no idea what’s happening to me, I don’t seem to get lost in any story these days. This one started so well - like a mix between Legend and An Ember in the Ashes. But my enthusiasm did not last long. Silly mistakes, convenient coincidences, strange decisions, characters switching sides just because they fall for each other.. I did like the overal story, the idea behind it, but not the actual execution. It could have been polished (quite a bit), but maybe someone who’s new to the genre might enjoy it a lot more. How the synopsis alone is making me gush with excitement is beyond me. May I please have this book immediately please? I might die otherwise. THE TIGER AT MIDNIGHT is without a doubt one of the best fantasy books I have ever read. Get ready to fall in love with Kunal, Esha, and a lush world as beautiful as it is dangerous. Swati's prose will have you laughing and crying and swooning, often in the same scene, and these characters stay wih long after you turn the page. 2019 can't come soon enough! "Never greet a tiger at midnight, for they are the manifestations of your past misdeeds." Esha is an assassin from Dharka. Kunal is a soldier from Jansa. Dharka and Jansa have been at war for decades after Jansa's murder of its leaders. The absense of those leaders and their magic has caused an imbalance between the two countries. When Esha is tasked with assassinating the general of the Dharkan forces to bring Jansa clos ARC provided by the publisher in exchange for an honest review. Esha is an assassin from Dharka. Kunal is a soldier from Jansa. Dharka and Jansa have been at war for decades after Jansa's murder of its leaders. The absense of those leaders and their magic has caused an imbalance between the two countries. When Esha is tasked with assassinating the general of the Dharkan forces to bring Jansa closer to taking control over the two countries and restoring balance, she runs into Kunal. Their paths become intertwined from then on, wrapped in a world rooted in Indian history and Hindu mythology. Esha -> A Viper goddess! Esha is an assassin in Dharka, deadly with her whips and knives and legendary in her exploits. I like Esha, although I did feel like, although she's supposed to be a legendary, skilled assassin, she makes A LOT of really stupid mistakes, which makes it hard to believe she’s actually like, a James Bond-level operative. She seemed to get lucky way too often. Kunal -> Kunal is, of course, a handsome, tormented young man who struggles to balance his morality with reality. On the flip side to Esha, Kunal likes Esha almost right away, despite the fact that he thinks she murdered the man who raised him...also hard to believe. I liked both characters though, and they live out a solid enemies-to-lovers plot line that I know a lot of people will absolutely adore. Otherwise, the book overall was a bit wordy, with maybe a little too much introspection because it gets repetitive. These things could be easily corrected/overlooked, though, while the bulk of this 500-page beast of a book presents a vast, exciting world based on an historic India. That enemies to lovers romance is hard not to like even if I had to overlook the moments it was hard to believe but, of course, there’s a twist that reveals more to their attraction than there appears. There’s just A LOT going on in this, which is a good thing on one hand because it stays interesting, but I also feel like I can’t properly appreciate what’s happening because I’m trying to keep everything straight. It’s VERY ambitious, and I’m not sure if it totally works. That being said, it was entertaining and the world drew me in. The writing was good, and the characters and conflicts, as numerous as the latter are, were interesting. There were also some solid twists that I did not see coming in the second half of the book- it just took a lot of words to sludge through before getting to them. This has a lot of potential, which is why I rounded it up to 4 stars. THIS BOOK. Morally gray YA fantasy with a cat-and-mouse game, steamy romance, and political intrigue. I neeeed this. 2019 can't come soon enough! Read an excerpt of this highly anticipated 2019 debut here so you can swoon in excitement with me! If you love action, epic world building, high tension hate-to-love (I'm dead, this is my ghost), and magic... I'm pretty sure you're going to need this book. Swati's writing is incredible and this debut is one you won't be able to put down. I couldn't!!! I had hoped that I would end up loving this book the most. That was not the case. At all. Oh. I was expecting so much from this story. I wanted danger and action and epic romance. I got none of those things. This whole book was such a disappointment to me, and that just breaks my heart. I wanted it to be much more. But it was not. At least, not for me. I'm sure others will love this book. But I did not. And I will be sharing all my reasons for not loving this book, and those reasons might end up I had hoped that I would end up loving this book the most. That was not the case. At all. Oh. I was expecting so much from this story. I wanted danger and action and epic romance. I got none of those things. This whole book was such a disappointment to me, and that just breaks my heart. I wanted it to be much more. But it was not. At least, not for me. I'm sure others will love this book. But I did not. And I will be sharing all my reasons for not loving this book, and those reasons might end up being many, and might be a little bit spoilery too. I give this book two stars. Because it had potential to be amazing. But it never got there. There is so much I wish to share about this book. And figuring out how to put my words down will not be an easy thing, sadly. Because my mind is kind of a mess. I struggled through almost five hundred pages to finish this. I would have stopped reading, except it was a print ARC that I had traded for, and I wanted to give it a chance, hoping it would get better. It did not. Sigh. So yes. This book was almost five hundred pages. And yet I feel like I have very little to talk about in this review of mine. Because the plot was barely there. Pretty much nothing happened. No progress. No excitement. I am beyond disappointed in this story. I felt like it could have been so much more than it was. I do feel sorry for being so negative, but really must be honest too. Because there were a few parts of this book that I actually liked a whole lot. Which is why it is a two star for me and not less. The world was incredible. The story of this place created was exciting. The fact that the land was dying and why and how it could be fixed was interesting. And I wanted to know more about it all. But I never got that. I never got more, and what I did get was way too little. And I am so upset about it. As this world building could have been so great, if only there had been more of it. Ugh. I needed more. Instead the whole book is about two characters. Kunal and Esha. Told from both their point of views. I so wish I could say that I loved the writing. But I did not. It annoyed me from start to finish. I did not connect with either of the characters, and that just hurts. Sigh. I wanted to love them. But I did not. They truly did nothing that would make me love them, to be honest. I thought they would both be fierce and deadly and beyond awesome to read about. Neither of them were. Haha. They were both way too soft for me. What. Which is something I pretty much never say, haha. I thought they would be broken and dangerous and a little soft deep inside. Instead they were pretty much not deadly at all and beyond soft, all on the outside as well. It bothered me. It made me not care for either of them. They were supposed to be broken. But I did not feel that they were. It was not shown what had happened to either of them. There was no tragic back story to read about. A supposed huge need for revenge, yet never shown why she wanted it. Sigh. This book fell completely flat for me. And I am so unsure how to completely write down my feelings about everything. I wanted it to be so much more than it was. I wanted the plot to be exciting and big and full of danger. Instead I got two teenagers pretty much chasing each other and falling in love and always always thinking about how they had both changed for each other, despite just meeting. Ugh. It was not sweet, at least not to me. I did not feel any kind of spark towards them. No romantic tension. That made me so sad. Not that there was a huge romance in this story. Because there was not. Kunal and Esha do have a little romance. But it was not epic and cute. I found it boring, to be honest. Why did he care so much for her? Ugh. And then, of course, they knew each other as children for a few short weeks. So now they must be in love. Yeah. No. Sorry, it was not written well enough. Not for me. I so wish I could say that I loved it all. I wish I could say that this book was incredible. But it really truly was not. I had to force myself to finish it. But yes. There were parts of it that I liked. I liked the world, but it was too little of it. I have not mentioned the plot much, but yeah. Esha is framed for killing Kunal's uncle, the general. And so he is now hunting her, to get justice for the murder. He is a soldier, have been for ten years, have killed a lot. Yet now he is all mushy and soft and is seeing the world so fully differently than ten minutes ago. What even. It made no sense to me, honestly. He should have been way darker. Ugh. I feel a little cheated, to be fully honest. And I sadly did not care for Esha either. We only learn a little about her, and what we do learn is repeated through the whole book. It grew beyond tiring. And then near the end of this there were almost hints of a possible love triangle maybe happening. Of her kind of feeling things for another boy. Yeah. No. So gross. Not for me. Esha was a rebel spy. Killing people. The Viper. So incredibly dangerous. Hahaha. Yeah. No. That was not true either. She was too soft. I never got to see her be really fierce at all. Fully disappointed. There is so much I still wish to share about this book. Probably even more that I have forgotten about that I wish to share, haha. But I'll stop now. Because I have already written way too much. And have not really said anything about the plot. But I won't bother to. Because this book was simply not good. And it is going to be a trilogy. What. I would, sadly, not read more books about these characters. It would fully bore me to death. I wanted much more from this book. Parts of it were interesting for me. But too little, too late, sadly. The Tiger at Midnight was everything I did not want in a book. And it ended up disappointing me the very most. And it is breaking my heart a little that I had to write this mostly negative review. Oh. But I had to. It do feel good to have shared all my honest thoughts about it. And I know some will want to read this book because of my review, which is great. As I know others will love this story. But I did not. I found the world and diversity to be written really well, though. But that, sadly, was all that was good about this story. Sigh. The Tiger at Midnight is a story of divided kingdoms, conspiracies and a tiny bit of magic. Esha is the Viper, a vigilante of epic proportions who finds herself framed and then hunted by the best of the best soldiers. Kunal is a soldier who after meeting Esha begins questioning his own upbringing, not realizing that both he and Esha will have bigger roles to play. The Tiger at Midnight is a stunning debut fantasy book that will thrill you, make you scream, and wrench your heart. This dual point of view story takes you into Esha and Kunal's heads as they dream of revenge, righting wrongs, and filling holes in their hearts with grief and retribution. Both Esha and Kunal come to question their roles in their revolutions, their duty, and exactly how far they're willing to go for their dreams. I'm not sure how much I can type out without ruining anything from this book, but I'll do my best. The beginning was a bit slow for me. I struggled to remember names and places, but it got much better as I got further into the book. The last 60% was so good! Ten years ago, the Jansa's queen and royal family were murdered. This started a war between countries that got along before then. Kunal spent that time in The Fort. He was a soldier, his uncle, the general. Kunal wants more than this l I'm not sure how much I can type out without ruining anything from this book, but I'll do my best. The beginning was a bit slow for me. I struggled to remember names and places, but it got much better as I got further into the book. The last 60% was so good! Kunal spent that time in The Fort. He was a soldier, his uncle, the general. Kunal wants more than this life though. Deep down, he doesn't feel like he should be a soldier. He loves art and has to hide it for years. He does respect his uncle though and will continue on with him. There are no women in The Fort, so it was odd when Kunal saw a young girl sneaking around. Esha was on a mission to kill the general. She pretended to be someone else when talking to Kunal, but she did give him her real name. She acted lost. They both talked a bit and felt a weird connection between them. But they were on different teams and Esha had a mission to complete. When Esha sneaks inside, she sees the general already wounded. He begged her to end his life quickly and she did. But she saw that someone had left a whip behind. It was a replica of hers. Someone was trying to frame her for the murder she was planning on committing. Since the general was killed by The Viper (Esha), four men are sent out to find her. Whoever caught her would be the next commander of the Fort. Kunal was one that was sent out. During this time, he saw how bad things were outside the Fort. There was a terrible drought and people were barely getting by. He finds out that his uncle lied about things. Kunal and Esha's paths kept crossing. They both still felt that connection, but they were supposed to be enemies. Esha always seemed to get the best of Kunal and was always ahead of him. They both find out things about their past during this time. There are definitely some twists and betrayals in the book. That's pretty much all I can share without spoilers. I gave this book 4 stars. Thank you to the publisher and Edelweiss for providing me with a copy of the book for review. The Tiger at Midnight beautifully plays off two sides of duty against each other, in a setting involving magical bonds to the land, a lost royal and a fragile truce. In the kingdoms of Jansa and Dharka, the royals are links to the earth itself, which depends on an annual sacrifice to keep it bountiful. Since the coup of Jansa by a Dharkan prince and the resulting war, the Jansan side of the sacrifice has been lacking, leading to a land that has been plagued with drought and misery. Esha, a Dharkan rebel and a famed assassin under the alias of The Viper, has been tasked with dismantling the current usurper on the Jansan throne, while Kunal is a Jansan soldier who is also the nephew of the general (who participated in the coup). Their paths cross on the night of the ceasefire, and begins a cat-and-mouse chase across the lands. The story of this book has a good balance between being character-driven and plot-driven. It is largely about Kunal and Esha reconciling their beliefs on honor and duty, though a major character change happens in the former as he gets to see how much he has been living a lie. Esha's path is more towards finally accepting to live her life for her own self as well, and not just revenge. Their whole chase/flirtation is one of the highlights of the book, and the chemistry is off the charts! As for the world-building, I didn't feel like it really had influences from Indian history, aside from the clothes and food, of course, but it still made for a richly detailed world that the characters populate. The reveal at the end was left on a sort of fork-in-the-road kind of cliffhanger, so I am excited to see where the story takes us from there in future books. Overall, it is a great debut, with delightful chemistry between the protagonists. She currently lives in New Swati Teerdhala is a storyteller and writer.